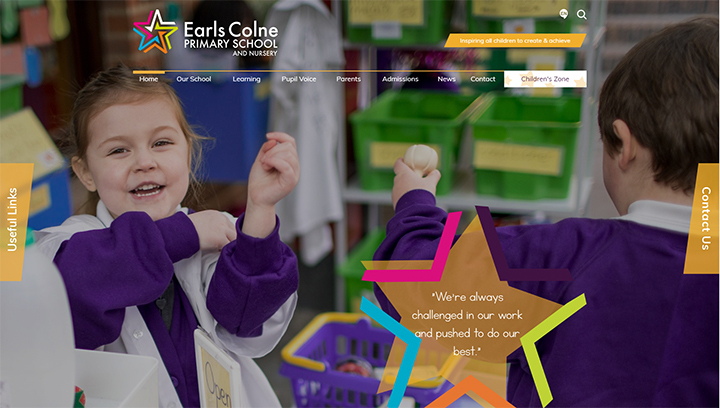 We’ve been working on some really lovely school website designs lately, including some delightful designs shared between several schools. 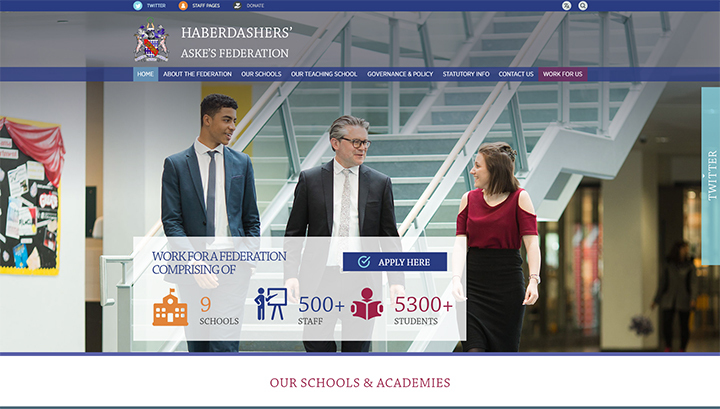 A shared design can bring uniformity and a unified feel to the websites of schools in a Federation or in a Trust, as seen here with the schools in Haberdashers’ Aske’s Federation. 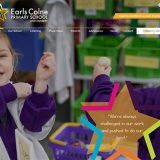 Each school has its own colour scheme applied to the shared designs, letting schools keep their own individual identity. As this Federation is quite large, they benefit from three shared designs, that were created with an overall group look in mind. 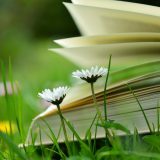 It was decided that the primary schools in the Federation should share one look, the secondary schools would share a second look, and finally, the Federation website and Teaching School website would share the third design. When first visiting the home page of the Federation website, the numbers in the information box count up from zero. Different sections of the website sweep onto the screen from the left-hand side when the page loads. 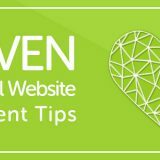 On the right side of the website is a twitter pop-out; the button gives a little wiggle occasionally to help ensure that it is not overlooked by visitors to the website. 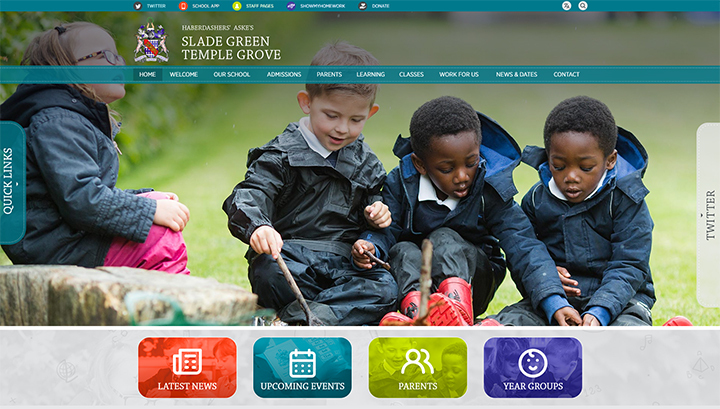 This website uses the Primary School shared design, choosing to use a mixture of colours including teal, pale grey and blue; the same style Twitter pop-out can again be found on the right side of the website. On the left-hand side, you can see a quick links pop-out box. Under the full-screen photo background are four vibrant boxes leading to important pages. A display of recent galleries sits below that again. 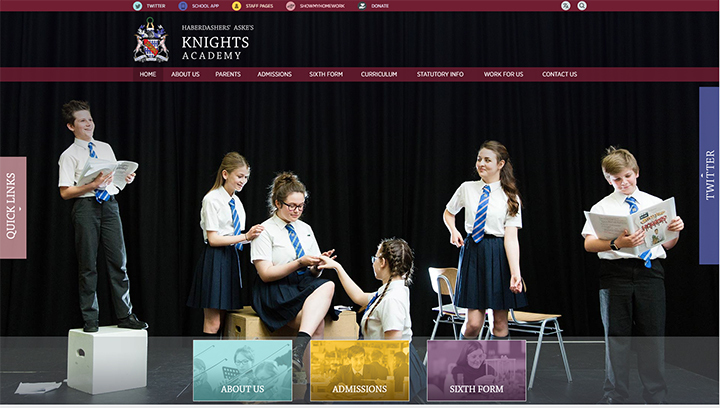 Knights Academy uses the shared design for Secondary schools in the Haberdashers’ Aske’s Federation. The predominant colour of this site is burgundy, which is complemented by more muted blues, pinks and purples. Under the three boxes for important links are Upcoming dates and Latest News. A transparent overlay of red and yellow, the school’s colours, customises the full-screen photo background. 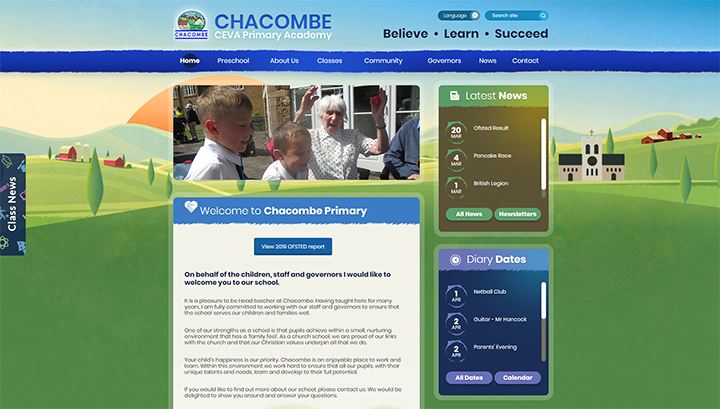 The menu and footer are blue, the other colour in the school’s logo. 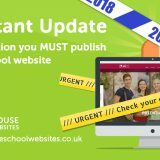 The homepage features a welcome from the headteacher, as well as Twitter, diary dates and a “Join us” box, where new vacancies can be advertised. We customised the menu to include a star pattern over the last menu item; the school have chosen to put a Children’s Zone here. The large star, taken from the school’s logo, acts as a frame for changing quotes, which are from students. The panel design features a range of photos as you scroll down the page. 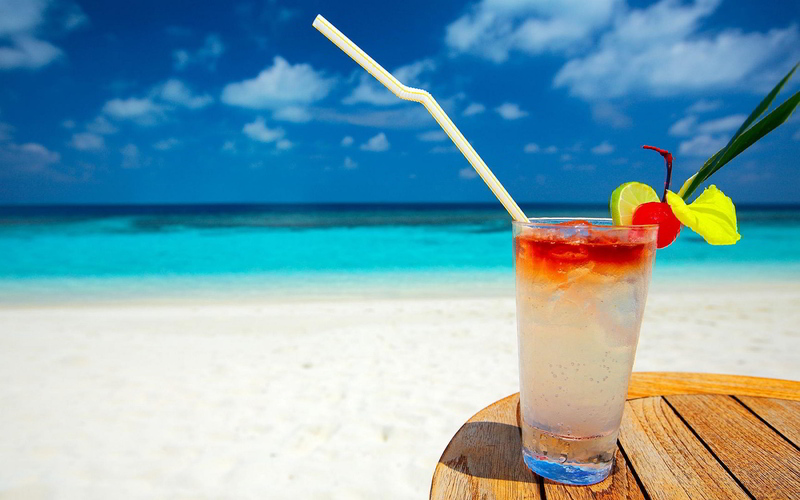 Overall, this creates a delightful website packed with features. 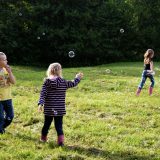 This Primary School Website design features an illustrated background which includes rolling hills, trees, a church and farm buildings, as well as a sunrise. The homepage has a small gallery, and boxes for the latest news and diary dates, as well as a welcome from the headteacher. The pop-out box on the left side of the page links to class news for each class in the school, making the most of the news sub-category feature. 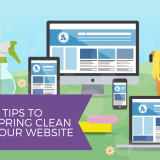 Is your school website overdue a new design? Get in touch! Have you been thinking about your school’s identity? Do you feel it’s a little lost in a bland or dated website design? 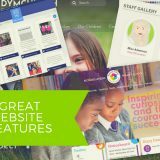 We would love to apply our expertise to tease out some of your school’s core strengths to shine through on a new website. It’s easy to make an initial enquiry and we can get the ball rolling with a quick chat. 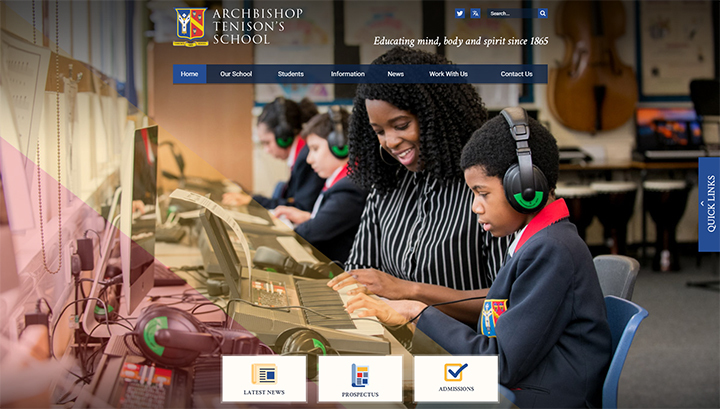 Take a look through our extensive school website design portfolio for some ideas. 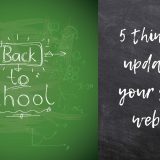 Or, take a look at our favourites from January 2019, or some of our many pink and red school websites. 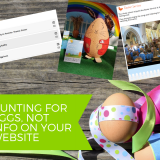 Previous story Easter – A time for Eggs and Exam prep!